"Several of these individuals who appear in Shivchei Ha-Besht also are listed on these annual inventories, many of which have survived in the archives. They are also found on the copy of the 1763 census of Polish Jewry. The individuals named are Hersh, the Besht's son; his daughter, Edel; Yechiel, the Besht's son-in-law..."
In the footnotes to this book it notes that in the 1763 census the Degel Machaneh Ephraim "is also listed as Froim together with his wife Jetel. This name "Jetel", however, conflicts with information in Glen Dynner's book "Men of Silk", in which he wrote, "R. Moses Hayyim Ephraim was matched with Esther, daughter of Gershon of Kuty, the Besht's brother-in-law. One of their children, Ethel, married David Horowitz, of another aristocratic family." Since the name "Jetel" appears in the 1763 census, I tend to think that this information from "Men of Silk" is inaccurate since the source of this information is not provided in Dynner's book. 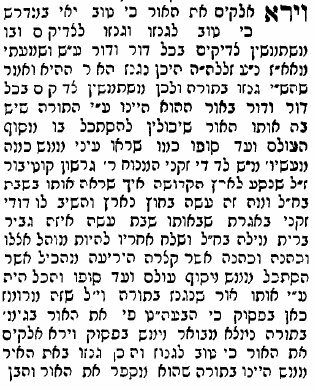 Additionally, in Degel Machaneh Ephraim, Parshas Bereishis, the Degel refers to R' Gershon Kitover as "Dodi Zekeini" ("my great uncle"), not as his father-in-law. It is extremely interesting to finally learn the name of the Degel's wife. Given the fact that the Degel was born in 1748, this would mean that he was 15 years-old or younger at the time of his marriage. To date, I have only heard this story about the Degel's wife and I would be interested to learn more information about her background. Interesting! I think your probably right. And although I found Rosman's book to contain a substantial amount of garbage, he brings documents and facts like these that are very useful. Another thing that I found interesting was that the Degel was listed as "Froim" in the 1764 census. My great-uncle's [whose father was from Sudilkov]Hebrew name was also Ephraim but pronounced by his family as "Froim". The census was probably recorded in Cyrillic Ukrainian. The census taker may have heard the name pronounced as something like "Yetel" and recorded it in Cyrillic letters that correspond to "Jetel." But that still leaves two possibilities for the Yiddish name: "Etel" (a diminutive of "Esther") or "Gitel" (which means "good"). I think "Etel" is closer, but that's just a guess. The article on JewishGen about given names (http://www.jewishgen.org/InfoFiles/GivenNames/index.html) has some good information, although it doesn't really answer your question. It does mention that Froim is the Yiddish form of Ephraim. Shoshana (Bershad): Thanks for your comment. I mentioned this to the Sudilkover Rebbe a few weeks ago and he seemed to think it was pronounced "Yetel"
Froim is a common way of saying Efroim. Motel for Mordechay. I’ve been trying to find some more information about the name of the Degel’s wife but have been unable to find anything further in online sources. I did, however, come up with a loose timeline and some background. According to some sources, Israel ben Eliezer, the Ba’al Shem Tov (1698-1760), first married at about age 18; his wife died soon thereafter. Around 1720, he married Leah Rachel (or Chanah), the daughter of Rabbi Ephraim of Brody. His wife’s brother was Rabbi Abraham Gershon Ashkenazi of Kuty (also known as Gershon Kittower or Kitover). He was the rabbi of Brody and a well-known Talmudic scholar and Cabalist. Since the Ba’al Shem Tov presented himself as an ignorant peasant, R’ Gershon at first disapproved of the match. In later years, however, he became one of the Ba’al Shem Tov’s most ardent followers. R’ Gershon traveled to Palestine in ~1742 and started the first Chassidic community there. Although many sources state that he arrived in Hebron in 1746 or 1747, there is a tradition that he studied Cabala in Jerusalem before 1743. According to a letter he wrote in 1757, he had lived in Hebron for 6 years [1743?-1749?] without his family (“Gershon relates that in the single Jewish courtyard there was so little room that they could not even let him bring his family”). He then went to the Beit El Synagogue (Yeshivat haMekubalim) in Jerusalem, where he lived for 4 years [1749?-1753?] with his wife and family. The famous letter from the Ba’al Shem Tov to R’ Gershon was written in 1752; in it, he refers to R’ Gershon’s wife, Bluma, and children. Apparently, R’ Gershon returned to Brody [~1753?] to arrange marriages for his sons and then returned to Jerusalem, where he died around 1760 (or 1765). The grandson of the Ba’al Shem Tov, the Degel (Moshe Mechane Ephraim of Sudilkov), was the son of the Ba’al Shem Tov’s daughter, Udel (Adel), and R’ Yechiel Ashkenazi. He is believed to have married a daughter of R’ Gershon. The Degel was born in 1748, around the time that R’ Gershon’s family moved to Jerusalem. If his future wife was born ~1750 in Palestine (when R’ Gershon was perhaps in his late 50s or early 60s and his wife, Bluma, was, presumably, much younger) and she returned to the Ukraine ~1753, she might have married the Degel in 1764 (the year they are listed together in the census). R’ Gershon would thus be BOTH the father-in-law of the Degel and his great-uncle! By the way, it occurs to me that the Degel’s wife might actually be a granddaughter of R’ Gershon; however, I could find no support for this hypothesis. What book was that? ...very interesting.